Taylor Swift kicked off the American Music Awards with an explosive performance and Cardi B won the first award of the night, dedicating the honor to her daughter. Cardi B beat out Drake and Post Malone for favorite rap/hip-hop artist during Tuesday night's show at the Microsoft Theater in Los Angeles. "I really want to thank my daughter," Cardi B said, adding: "I gotta prove people wrong. They said I wasn't going to make it after I had a baby." The rapper gave birth to Kulture Kiari Cephus in July. She is married to rapper Offset of the hip-hop group Migos. The AMAs, airing live on ABC, started with Swift onstage singing "I Did Something Bad" from her "reputation" album. She was backed by more than a dozen dancers during the dramatic and smoky performance as a large snake hovered behind her onstage. The performance marked her first awards show performance in three years and comes days after Swift broke her long-standing refusal to discuss politics in a lengthy Instagram post. Other set to perform include Cardi B with Bad Bunny and J Balvin, Mariah Carey, Carrie Underwood, twenty one pilots and Jennifer Lopez. The show will also pay tribute to Aretha Franklin, who died in August. Swift is nominated for the top prize — artist of the year — where she will compete with Ed Sheeran, Imagine Dragons, Post Malone and Drake, who tied with Cardi B for most nominations with eight. Due to their success on the pop and rap charts, Drake and Cardi B earned nominations in both the pop/rock and rap/hip-hop categories. In the rap/hip-hop and pop/rock categories, Drake is up for favorite male artist, favorite album and favorite song with "God's Plan." He has the year's top-selling album with "Scorpion" and also scored three No. 1 hits on the Billboard Hot 100 chart. 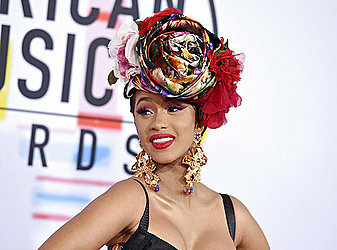 Cardi B's collaboration with Bruno Mars, the remix of "Finesse," earned two nominations and she also earned a nod for favorite music video, among others. Her album, "Invasion of Privacy," was surprisingly shut of the favorite rap/hip-hop album category. Rapper-singer XXXTentacion, a streaming juggernaut before his death in June and afterward, earned nominations for new artist of the year and favorite soul/R&B album for his 2017 debut, "17." He won best new artist at the BET Hip-Hop Awards this month. The Queen of Soul will be remembered with a performance by Gladys Knight, Ledisi, Mary Mary, Donnie McClurkin and CeCe Winans. The musicians will pay tribute to her gospel roots and her iconic album, "Amazing Grace." Golden Globe-winning "black-ish" actress Tracee Ellis Ross is hosting the fan-voted show and danced to a number of hit songs following Swift's performance. Presenters include Tyra Banks, Chloe x Halle, Macaulay Culkin, Sara Gilbert, Heidi Klum, Lenny Kravitz, John Stamos, Amandla Stenberg, The Chainsmokers and Rami Malek.